[M]y impulse is to identify with the bearded philologist, the one who loved anomalies: this is due to a psychological inclination which, however, I would consider justifying even on rational terms. The violation of the norm contains even the norm itself, inasmuch as it is presupposed; the opposite is not true. Anyone who studies the functioning of a society beginning from the entirety of its norms, or from statistical fictions such as the average man or the average woman, inevitably remains on the surface of things. I think that the in-depth analysis of an anomalous case is much more fruitful, though the contemplation of an isolated oddity does not usually interest me. In historical research, [Ginzburg] has often contended, the anomaly tells us more than the rule, because it speaks also of the rule, whereas the rule speaks only of itself: the exception is thus always epistemologically richer than the norm. This, however, is not so. By definition, an anomaly is only such in terms of a rule, which ontologically commands it. If there is no rule, there can be no exception to it. But the converse does not hold. A rule does not depend for its existence on an exception. “The violation of the norm contains even the norm itself”: thus Ginzburg. But under Anderson’s jurisdiction, the rule “ontologically commands” the exception: “If there is no rule, there can be no exception to it.” The blunt confidence of Anderson’s rebuttal (“This, however, is not so”) — vexed as it may be by a genuine appreciation for Ginzburg’s gift — can be diagnosed as a specimen of the scholastic fallacy Pierre Bourdieu called epistemocentrism: Bourdieu’s fancytalk for that bananapeel you skateboard around on when you mistake the laws of logic for the order of things. How do we determine the laws of logic in the first place? And how do we enforce them? Sometimes I think the singular of loss is law. More startling, perhaps, is the fact that Anderson’s counterargument to Ginzburg can be found verbatim in a book called Modern Thomistic Philosophy: An Explanation for Students (1934) by Richard Percival Phillips, a schoolboy’s guide to the Schoolmen: “If there is no rule there can be no exception: if there is nothing essential there can be nothing accidental or by chance.” I can’t imagine Anderson had this exact argument in mind — this comes, after all, in a chapter called “The Demonstration of the Existence of God” — but it does allow us to hear a theological accent in his critique. Perhaps it is even a latent political theological accent. I propose we take these different ways of framing the anomaly — these arguments on both sides of the case — as an opportunity to ponder the relation between “rules” and “exceptions,” between “norms” and “violations.” What is the substance of these distinctions and these relations? The best answer to the question as I see it can be established by deciding the following: are “rules” to be understood as metonyms or symptoms of a steady-state totalizing law of nature to which the analyst has privileged access — the domain of ontology or theology, as you wish, which in turn gives them a commanding or prescriptive force? Or might “rules” rather be considered human descriptions of states of affairs — which is to say, phenomenological (experienced) and pragmatic (actionable) accounts subject to adjustment when more information (feedback) comes in? Consider a thought experiment: we fabricate some placebo socket wrenches. They look like socket wrenches, sound like them, feel like them. But we design them so that when you put the socket over the loose nut and tighten it, the nut will stay loose. We secretly place these wrenches in the toolboxes of a randomly selected set of mechanics at the car repair shop. Now if we discovered that the nuts these mechanics were working on really did tighten up, we would have good reason to be surprised. The only thing that can tighten up nuts is a (real) wrench. When the sugar pill relieves symptoms and cures disease, it confutes a dominant cosmology of cause and effect and achieves what normal science says it couldn’t: it performs the impossible. If we remember (a) that placebo is (according to some recent studies) more effective than the going “antidepressants” and (b) that 11 billion dollars per year are made in that pharmaceutical market, this anomalous blip turns out to be no small matter. When people recover from illness under the influence of fake treatments, they must of course in reality be healing themselves. But if and when people have the capacity to heal themselves by their own efforts, why do they not simply get on with it? Why ever should they wait for third-party permission — from the shaman or the sugar pill — to heal themselves? How strange that people should be condemned to remain dysfunctionally sick just because — as must still often happen — they have not received permission. If it’s the case that the doctor and the sugar “make nothing happen,” why don’t patients skip the appointment (and the bill it comes with), cut to the chase, and heal themselves by their own efforts? But the very grammar of the question misunderestimates (if I may use that presidential verb) the relational substance of the process at hand. The placebo’s power — its capacity, we might say, to anomalously conjure a return to health — is a distributed accomplishment, contingent on the circuits of trust at hand. It follows as a consequence of “a social fact,” as Durkheim would call it. The shaman heals you because you believe the shaman can heal you. It’s not a private property but a relationship that does the deed, and what the deed indicates is not a shortcoming in the patient’s way of knowing — their failure, as Wittgenstein might put it, to “follow the rules” (Philosophical Investigations §125) — but rather the limits of Western medicine’s empiricism and the cosmology of cause and effect it purports to command. The rule is not that Western medicine has a comprehensive conceptual and practical monopoly over the laws of health, but rather precisely the opposite. The distributed conjuration of health that we call the “placebo effect” is experienced as an exception only to the believer or devotee of the system that cannot explain its operation. The anomaly points to that larger scheme that eludes the grasp of what presumes to be a comprehensive system of explanation. In this sense, as Ginzburg suggests, the violation of the norm contains the norm, precisely to the extent that it reveals the limits of the norm’s application. I think of the relation like this: the system of rules is a grid that makes legible the anomaly that in turn renders the grid obsolete once the anomaly is properly perceived for what it is. The anomaly, we might say, once it is understood, absorbs the grid it evades by making visible the grid’s provisional character while indicating a larger scheme in which the anomaly both makes sense and is quite simply indicative of the way things are. If I may hazard a thesis: phenomena do not follow rules because rules are modelled after a transcendental truth (theological, ontological, or otherwise). Rather, phenomena follow rules because our descriptions and demonstrations and the actions and events they describe are in agreement. And perhaps we could also say that phenomena follow rules to the extent that we, the makers and exchangers of descriptions and demonstrations, agree that they do — because we are in the practice of saying, and agreeing with each other when we say, that phenomena follow the rules. This is not to say that phenomena don’t have tendencies and regularities that characterize and perhaps even define their behavior — “norms,” to use Ginzburg’s term — but only to insist that our experience of their unruliness is in direct proportion to the stories we tell about them. Clever as we are, I think we’ve yet to remember that this is the case, that we have the power to tell different stories if and as we need to — to perform actions and precipitate events that swerve against the grid of expectations, and which invite us to compose more deliberately new sets of habits of thinking and feeling, and of trying and doing. The placebo effect’s improbable power inverts the action of the panopticon as Michel Foucault describes it. The “panopticon effect” (if I may call it that) depends on the fact that humans tend to behave as if we’re being watched by a guard if our cell is in view of the watchtower, which need not in fact be occupied for this effect to take hold. “A real subjection is borne mechanically from a fictitious relation,” Foucault writes. With the placebo effect, by contrast, a real liberation is instantiated — a liberation from the symptoms of disease (from pain, for instance) — but the fictitious relation is interesting to specify. After all, the relation between the healer and healed is a real one; the “fiction” lies in the swapping of the sugar pill for the pharmaceutical. As Michael Taussig suggests, “patient and shaman conduct on behalf of society a joint interrogation of their ideological environment.” It’s as if all the doors in the prison swung open suddenly not so much to the touch as to the very thought, revealing that they were never locked in the first place. What was Blake’s phrase? “Mind-forged manacles.” What were walls and barriers turn out to contain windows and doors. The enclosures turn out to be what Emily Abendroth calls “exclosures.” Miranda observes a bird in the yard and says, “That one always lives outside.” Maybe we’re not as stuck as we think we are. What other forms and structures might we imagine — whether actual architectures or social infrastructures — that could produce not the “real subjection” Foucault describes but rather a “real liberation” of the sort the placebo supplies, forms and structures whose design is aimed at producing not “the homogenous effects of power” (200) but rather a heterogeneous unleashing of potential? What needs to be the case for things to be otherwise? Paul Celan in his notebooks defines the poem as “that which does not fit the measure.” The poem in this sense is immune to regulation, an incommensurate anomaly that fails to comply with the going metric. Carl Schmitt, for his part, famously decreed: “Sovereign is he who decides on the exception.” With Celan in hand we might rejoin: poets are — or could be — those who produce the exception by performing the other side of the normal form, metabolizing impossibility and thereby transforming conditions of possibility in the first place. We might imagine here the potential of poetry as sovereignty’s solvent, as a tool for re-imagining our forms of belonging over and against Schmitt’s one-seater model. 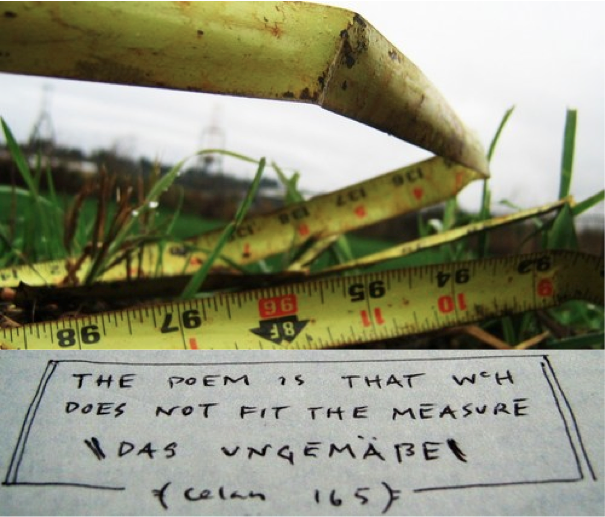 By failing to “fit the measure” or “follow the rules,” a poem can succeed in refuting what Anderson claims is an “ontological command,” and can contain, to use Ginzburg’s verb, the measure it exceeds. Like the power of the placebo, this potential is not a private property but a substance that transpires in relation, a common ground of language in action. The poem is at last between two (or more) people, as Frank O’Hara once decided, and not between two pages. [Poetry] commonly exceeds the measure of nature, joining at pleasure things which in nature would never have come together, and introducing things which in nature would never have come to pass; just as painting likewise does. This is the work of the imagination [which] at pleasure makes unlawful matches and divorces of things. “Joining at pleasure,” Bacon tells us, in excess of “the measure of nature”: that’s what poetry does. I like this, in spite of (and perhaps even because of) Bacon’s censorious intent. Lauren Berlant has described the way in which “a situation […] that feels like a massively genre breaking one can become the kind of event whose enigmatic shape repels being governed by the foreclosure of what has happened before.”  Das Ungemäße is Celan’s original German noun, translated by Pierre Joris as “that which does not fit the measure”; the root term here, das Gemäß, is “that which corresponds,” “that which matches,” or “that which is in accordance or in compliance with” — that which is, we might say, in accordance with “what has happened before” (to use Berlant’s terms), or “the measure of nature” (to use Bacon’s). Celan’s radix, Mäß, was some kind of Swiss measure, I gather, which surely has traveled the same route as our word “mass,” from the Latin massa, “lump, bulk, parcel of land, dough.” I admit that I want “mass” to do too much work here, to have the standing of expectation on the one hand, and of something like gravity on the other, so that the poem can become a vehicle in which to achieve a kind of escape velocity — a means by which to exceed, evade, or transform the resistance of norms that have forgotten their origins in practice. How does the Law of Mass Action go again? Let’s put poetry to the side for a moment and ask: Are there undecideable exceptions to the rule that says “sovereign is he who decides on the exception”? That is, are there exceptions that exceed the power of any one sovereign to “decide”? These questions concern jurisdiction, the area in which a law can be spoken — or better still: heard. The zone in which law is audible. Here’s a stark and simple-minded version of the kind of question I’m asking: can the sovereign “decide” on an exception to the law of gravity? Of course not. Humans don’t suddenly acquire the power of flight because some primate wearing a suit or a cape declares it so by the power of speech and the wave of a wand. social organization can actually negate individual limitations. I mean this negation in much more than the sense that ten people can lift a weight ten times as great as can one person. None of us can fly by flapping our arms. That is a biological limitation. Yet we do fly as a consequence of the social organization that has given rise to airplanes, airfields, pilots, controllers, fuel, metallurgy, hydrodynamic theory, and organized economic activity. It is not society that flies, however, but individuals. Thus, the constraints on individual human beings have been negated by social activity, and they have become new individual human beings with new properties and abilities. The airplane thus flies into view as an emblem of individual impotence transformed by means of something we might call collective expotence. A law of nature — the human animal cannot fly — is transformed by a law of culture — the collective power of the human animal to subsume the individual human’s inability to fly. (Surely I don’t need to add: the sovereign has had nothing to do with it.) This is not the same as the causal force of the placebo effect, exactly, but it is not unrelated, insofar as the human power of flight — which is to say, the power to produce and sustain the anomaly, to compose what at first blush looks impossible — is a distributed, not a private, property. It didn’t come from nowhere. If it came from nowhere, if it came from nothing, it is basically trying to let you know that you need a new theory of nothing and a new theory of nowhere. Sometimes the impossible is the missing ingredient. Such anomalous collaborative accomplishments — the placebo effect, the human power of flight — allows W.H Auden’s famous definition of poetry to take on a new shape. “Poetry makes nothing happen”: this line from his 1939 elegy for William Butler Yeats could well be taken as a confession of impotence. But it could also be taken as an affirmation of poetry’s potency, its dynamic capacity to actively make nothing happen. I have in mind here the fact that the root of the word “poem” reaches back to the Greek word poiein — “to make.” What could this mean, to make nothing happen? If we take “nothing” to mean that which is denied existence by a standard model or rulebook — that sugar pills can’t cure disease, that humans can’t fly (“This, however, is not so,” as Perry Anderson avers) — then the sentence would appear to describe a rare and forgotten kind of power: the power to perform what is said to be impossible. What’s more, “make nothing happen” is a fantastic description of what a general strike could accomplish: an active negation of our status quo (and psychotic) schedule of production and consumption. The general strike in this sense constitutes a maximal instance of sabotage as defined by Elizabeth Gurley Flynn in the wake of the 1913 Paterson Silk Strike: “the conscious withdrawal of the worker’s efficiency.” I am aided and abetted in my recycling of Auden’s line in this militant vicinity by a poem by Anna Louise Strong that prefaces a pamphlet describing the Seattle General Strike of 1919. ”They Can’t Understand” is its title, and its first two lines read as follows: “What scares them most is | that NOTHING HAPPENS.” Workers encounter the possibility of their greatest power by removing their efficiency, indulging in a hyperbolic impotence that flips over into a demonstration of otherwise foreclosed forces that frighten the powers that presume themselves to be in command. Thus far I have been talking about “poetry” in the abstract. Let’s see if we can affirm, or at least firm up, some of these claims in relation to an actual poem written by Robert Creeley as a birthday present for Stan Brakhage, a filmmaker who sought, and achieved, an outlaw undomesticated way of seeing in his films. A world, in other words, before visual and verbal logics enclosed what can be perceived, before concepts dominated the objects of perception. Many of Brakhage’s films are handpainted — produced, that is to say, by subtracting the camera, and applying pigment directly to the film strip, thus sabotaging or short-circuiting the normal form of the apparatus. One of his more extreme investigations of “unruled” images came in the early film Mothlight (1963), which he made by gluing and taping flowers, moth wings, seeds, dirt directly to blank leader, giving us not a picture or a story about such things but an accelerated projection of the things themselves. It’s one of the most beautiful films I’ve seen. It gives viewers the chance to recognize something we’ve never perceived before. Not at that speed. Not together. Not at that scale. Which is to say: Brakhage’s willful misuse of the apparatus reveals not only a potential the medium contains, but also a potential contained by his audience. The conscious withdrawal of efficiency reveals a hitherto foreclosed co-efficiency. Creeley’s poem addresses this improbable success. How are we supposed to read these lines? It’s like a self-licking ice-cream cone spliced with the river Herakleitos says you can’t step in twice. The poem registers an objection to the prelapsarian logoklasm of Brakhage’s program, his desire to go back to before “in the beginning was the word.” But in so doing it inadvertently metamorphoses into an acknowledgement, even a celebration and performance of, the accomplishment it seeks to deny. Is it too obvious to note that the subject here is plural? The poem’s logic articulates a Möbius Strip that flips back and forth between affirming nothing and actually doing it, between doubting and making nothing happen althesame. Crude paraphrase: if we do what can’t be done, then we’ve done it. We project possibility by projecting impossibility. I take this to be a successfully experimental poem in the primary sense that its effects can be repeated, just as the stage directions in square brackets command. We end where Creeley began, in the adversative: “But” — which the verse that is about to repeat has just converted into the affirmative. The beginning of this objection is also the title, which initiates the circuit that leads to the accomplishment that obviates the exception by making it the norm — a norm that may well await subsequent containment by the anomalies that emerge in its light. Hence there is reason to suspect that A is true. 1. If P, then Q. When abduction occurs in scholarly disputation, it is often called out as a fallacy — the fallacy of “affirming the consequent,” to be precise. One person’s judgement is another’s error. If you’re wrong, I’m right. Creeley’s poem is my favorite instantiation of this problem, not least since it transposes the force of logic to the more slippery slopes of space and time on which Brakhage’s forceful example is projected and refracts verbally into unexpected potential. […] it is just by such difficulties as the one now in question — such roughnesses — such peculiarities — such protuberances above the plane of the ordinary — that Reason feels her way, if at all, in the search for the True. Those “extraordinary investigations,” properly conducted, generate new understandings of the way things are, a radical epistemological transformation with consequences that go all the way down. The logic of the successful new paradigm, in this sense, would at once contain and exceed the earlier paradigm’s ontological command, insofar as those “conceptual boxes” of “professional expectation” made the stimulating anomaly visible in the first place, which in turn renders those boxes obsolete, at least as truth containers (they could well be repurposed to other ends). The anomaly etymologically is that which is uneven, irregular, or rough — quite literally “the unsame,” from the Greek an- “not” + homalos “even,” with homo “same” at the root. To out this in the syntax of Ginzburg’s topology (“The violation of the norm contains even the norm itself”) we could say that the unsame contains the same. Playing further with these radicals can allow us to capture a piece of the “collective expotence” I’ve tried to describe. The English word “homily” comes from the Greek homilia, the term translated in the New Testament as “sermon,” but which also means “discourse” or (better still) “conversation,” and derives from homilos “an assembled crowd,” which of course shares the same root as anomaly: homo. The anomaly can thus be said to contain the homily in the sense that the conversation reveals the limit that the contagious irregularity shows us how to exceed. We’ll be there! In those days the church was not merely a thermometer that recorded the ideas and principles of popular opinion; it was a thermostat that transformed the mores of society. A thermostat is not just a dial on the wall, but a dial capable of setting the temperature — of exceeding the measure, as Celan might put it — as a consequence of its ability to record it accurately in the first place. Another way of putting it: where the thermometer pays attention, the thermostat makes a tension. Mind the verbs. It costs to do the one, while the other involves a making, a poiesis. I freely admit that the etymology is whimsical. But it’s also not far from the mark: a tendon is what we control our muscles with, a crucial component in our relation to power. When we pay attention, our cognition stretches out to the object of our interest. And perhaps we can say, using King’s modifier, that when we merely pay attention, our muscles are at the ready to do someone else’s bidding: that’s what we are paying for by being at another’s command. When we make a tension, on the other hand, we acquire for ourselves the privilege of setting the temperature and the tempo, composing the tempest, even (if I may activate the radix). No doubt that takes a lot of coordination: so many parts involved, ro(u)les to play, coupling an improvisatory understanding of the fleeting situations we find ourselves in with a metabolically competent infrastructure. Not just a sly dial on the wall, but a dial wired to furnace with a steady power source. There’s no joke about the stakes involved. When the set-up malfunctions, at best you’re in the cold; at worst your house or neighborhood burns down. But when your neighborhood is already burnt to the ground, or torched before it even got started, well then, you’re already embarked: the coin is in the air; all that remains is for you to decide. Which side are you on? Pay attention or make a tension. Stick with the environment as it is, repeating it blankly, or rise above or below it, collectively composing the poem Celan describes: the one that does not fit the measure. One nice thing about the choice is that there is no zero-sum here. Just as the anomaly includes the rule it breaks, a thermostat includes a thermometer — which is of course itself a useful device: something the proverbial frog in the pot is lacking. Carlo Ginzburg, Threads and Traces: True False Fictive, tr. Anne C. Tedeschi and John C. Tedeschi (California 2012), 222. Perry Anderson, “The Force of the Anomaly,” LRB 34:8 (2012). Pierre Bourdieu, Pascalian Meditations, tr. Richard Nice (Polity 2000 ), 50ff. Richard Percival Phillips, Modern Thomistic Philosophy: An Explanation for Students, Volume II: Metaphysics (The Newman Bookshop 1934). Daniel Moerman, Meaning, Medicine and the ‘Placebo Effect’ (Cambridge 2002), 137. Nicholas Humphrey and John Skoyles, “The evolutionary psychology of healing: a human success story,” Current Biology 22:17 (2012), R697. Michael Taussig, Shamanism, Colonialism, and the Wild Man: A Study in Terror and Healing (Chicago 1987), 460. Taussig is discussing Claude Levi-Strauss’s description and analysis of New World shamanism. Emily Abendroth, ] Exclosures [ (Asahta 2014). Paul Celan, The Meridian: Final Version — Drafts — Materials, tr. Pierre Joris (Stanford 2011), 165. Carl Schmitt, Political Theology: Four Chapters on the Concept of Sovereignty, tr. George Schwab (Chicago 1985), 5. “The other side of the normal form” is Niklas Luhmann’s definition of chance. I explore this hypothesis at greater length in an essay called “Making nothing happen: poetry and sabotage,” forthcoming in postmedieval (2015), 6:4, which (as the title suggest) also intersects with my recycling of Auden’s famous definition of poetry in what follows. Jordan Greenwald, “Affect in the End Times: A Conversation with Lauren Berlant,” Qui Parle 20:2 (2012), 72. We could think here on the parable of King Canute, who set his throne on the beach below the high tide line and commanded the sea to halt before it wetted his shoes, which in turn might put us in mind of Cuchullain’s fight with what Yeats nicely describes as “the invulnerable tide” — even as their exertions reflect quite different purposes. Richard Lewontin, Biological Determinism (Tanner Lectures 1982), 179; cf. his discussion in Biology as Ideology (Harper 1991), 121. Miranda Mellis, The Spokes (Solid Objects 2012), 19. Elizabeth Gurley Flynn, Sabotage: The Conscious Withdrawal of the Workers’ Industrial Efficiency (I.W.W. Publications Bureau 1917). Anise (Anna Louise Strong), “They Can’t Understand,” in The Seattle General Strike (History Committee of the General Strike 1919; reprinted by The Shorey Book Store, 1971). More recently, Jasper Bernes has published a collection of poems called We Are Nothing And So Can You (Tenured Ninja 2012), whose title, among other things, negates the Occupy slogan (“We are the 99%”) to mash it up with Steven Colbert’s I am America and So Can You (2007). Juliana Spahr’s contribution to a portfolio of poems on “The Insurrectionary Turn” in The American Reader (November 2012) offers a more tentative affirmation of nothing: “I could tell you of the other things too. | A European influence. | A Middle Eastern influence.| A list of skirmishes. | A feeling of it being nothing. No wait, something. No see, nothing. Possibly something. No. | Nothing.” Bernes: http://www.deepoakland.org/~deepoak/text?id=330. Spahr: http://theamericanreader.com/the-insurrectionary-turn-cont. I explore Flynn’s strategically capacious definition of sabotage further in an essay called “The difference is spreading: sabotage & aesthetics ~1913,” forthcoming in the first volume of Black Box: A Record of the Catastrophe. David Simon, The Wire (2004), Season 3, Episode 11. Stan Brakhage, Metaphors on Vision  in Brakhage Scrapbook: Collected Writings 1964-1980 (McPherson 1982). The Collected Poems of Robert Creeley: 1945-1975 (California 1982), 551. First published in Thirty Things (Black Sparrow 1974). Charles Sanders Peirce, Collected Papers: Volume 5 (Harvard 1935), 189. I myself prefer conversation, which is a “turning” | verse we do “together” | con, to sermon, which is too often something done to us.